Hosted by Cam Mather, who has grown organic vegetables for thirty years; Grow Your Own Vegetables is a straightforward instructional DVD to economically producing one’s own food. From soil preparation to planting, weeding and watering, and dealing with insects and pests, to harvesting, storage, and more, Grow Your Own Vegetables emphasizes low-energy, earth-friendly approaches with step-by-step, easy-to-follow guidance. 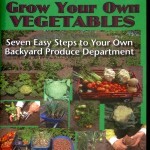 A superb how-to guide, enthusiastically for organic gardeners of all skill and experience levels. 2 hours.